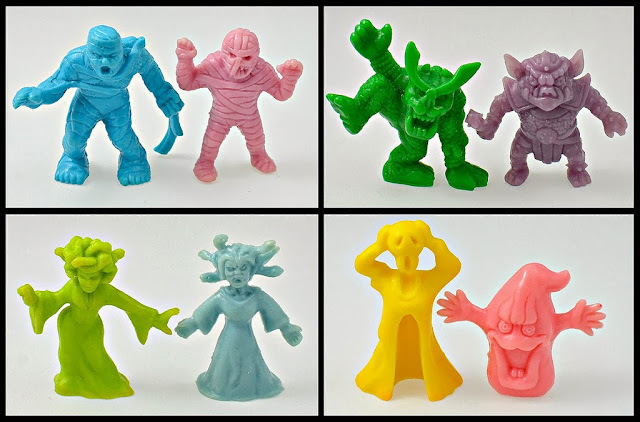 Shortly after I found out about Neclos / Necros Fortress keshi from Japan and took on collecting them, I started to think of them kind of like the Monster in My Pocket toys of the East. Despite some main differences between the two lines (most notably the fact that Neclos Fortress is also a role-playing game and includes figures of non-monster, human characters as well), the two lines are pretty comparable. The figures are similar in size, made of the same type of flexible soft plastic material and a variety of monochromatic colors, and both feature an army of monsters pulled from folklore and mythology. I think they were also both released around the same time (although from what I have been able to tell, Neclos began a bit earlier than MIMP, in the late-1980s). Check out the image above, which compares interpretations of a few of the same monsters from both lines: Mummy, Hobgoblin, Medusa and Ghost. This is just a small sampling of monsters the two lines share. In fact, there's nearly 40 I've counted (check out a list below--let me know if you think of any I missed). Personally, I find it nearly impossible to decide which line I like more. Monster in My Pocket is a classic that's hugely responsible for my love of these kinds of toys, but Neclos Fortress is also an amazing, incredibly diverse and comprehensive line that I went nuts over as soon as I found out about it within the past couple years. So...I refuse to choose! How about you? Do you prefer MIMP over Neclos (or vice versa)? Are you interested in both lines? I'm a MIMP man, I've never collected any Neclos figs. I'm not sure if they even showed up in the UK, whereas MIMP was big over here - we got a few of the later series that weren't released in North America. I'm tempted to start collecting Neclos though, they look brilliant. I love both lines, but love MIMP about six hundred times more than Neclos - mostly because I've only ever been able to get hold of seven Neclos figures... ever. That comparison picture though, love that! Would you consider doing the same for ALL of the shared monsters? Well said! I'd have to say they are my two all-time favorite lines as far as LRGs go. Not only because the figures are really cool, but as you said they are both really fun to collect because of the number of figures and variations.